If you have an unlimited marketing and advertising budget feel free to skip this page. However, if you’re like the other 99.9632% of authors in need of cost effective ways to get attention, keep reading. Guerrilla marketing (or grassroots marketing) consists of any unconventional marketing strategy that gets maximum results from minimal resources. We’ve successfully used unusual (some say absurd) approaches to get ridiculous amounts of attention. In fact, some of our biggest success stories have been the result of innovative out of the box guerrilla tactics. We have a saying around here: “There are no bad ideas”. Here are some examples of how we’ve used grassroots marketing effectively. 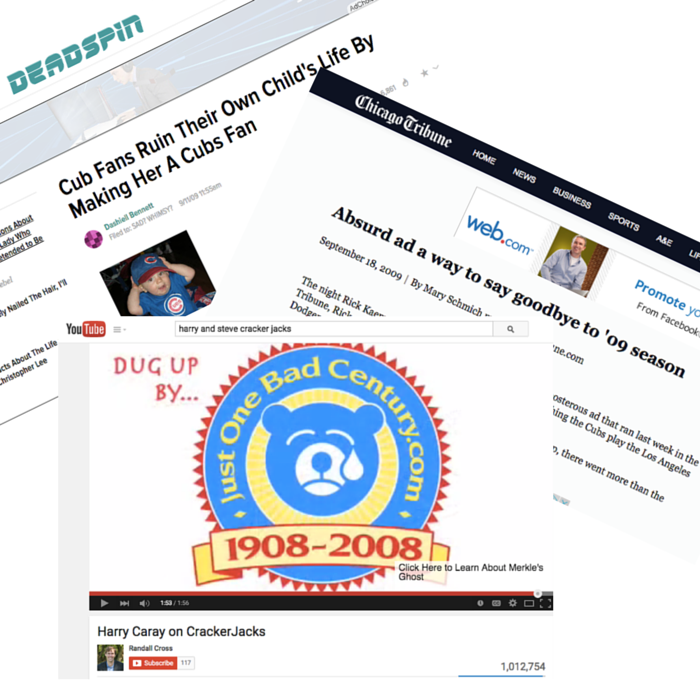 Waitle Nex Yeare, September, 2009 – Our first foray into digital publishing was when our parent company, Just One Bad Century created and released their self titled Cub fan blog, justonebadcentury.com. Barely a year old, justonebadcentury.com was struggling to find an audience. There were literally thousands of Cub blogs in the blogosphere. With a marketing budget of about nothing, Rick and Dave (principals of JOBC, Eckhartz Press and E Author Solutions) needed a way to attract a large following to make the blog profitable. Suki and Justa Crappi Yeare of Chicago’s North Side are proud to announce the birth of their daughter Waitle Nex, born August 20th in Los Angeles. The entire Yeare family eagerly awaits her arrival back in Chicago. The first Waitle Nex Yeare was born in Chicago in 1909. It’s too bad great-great grandma isn’t around to see the birth of her namesake. Baby Waitle was born several weeks premature but is somehow perfectly healthy. Doctors tell us the chip on Waitle’s shoulder will wear down over the winter and she will be 100% healthy next spring. You should see how cute she looks with the albatross necklace around her neck. Pictures available at www.justonebadcentury.com. After a couple of Chicago morning radio shows read the announcement, it started getting traction. Unbelievably, people actually thought that the announcement was real. By lunchtime, Facebook and Twitter (the only viable social media platforms back then) were blowing up with thousand of mostly vitriolic posts, shares, tweets and retweets of the Chicago Tribune’s announcement. NBC, The Los Angeles Times, Deadspin, Capitol Fax, The Huffington Post and ESPN all posted it. By mid afternoon, NBC broke the news that the announcement was a hoax. A few days later, The Chicago Tribune’s Pulitzer Prize winning columnist, Mary Schmich ran a piece. Our humble previously unknown blog received national attention and got tens of thousands of hits. One of our videos now has over one million views, largely due to the birth of Waitle. The Pothole Store, January 2014 – In mid November of 2014, Rick and Dave got into a bit of a pickle. While at a presentation with a client, Dave boasted that virtually anything could be sold with a solid creative concept and an effective online marketing strategy. Unimpressed, the client (who is a great friend and colleague) challenged Rick and Dave to sell trash on the internet. Uh-Oh. Both coming from a long line of stubborn Germans, Rick and Dave couldn’t pass up the challenge. That’s when The Pothole Store was born. 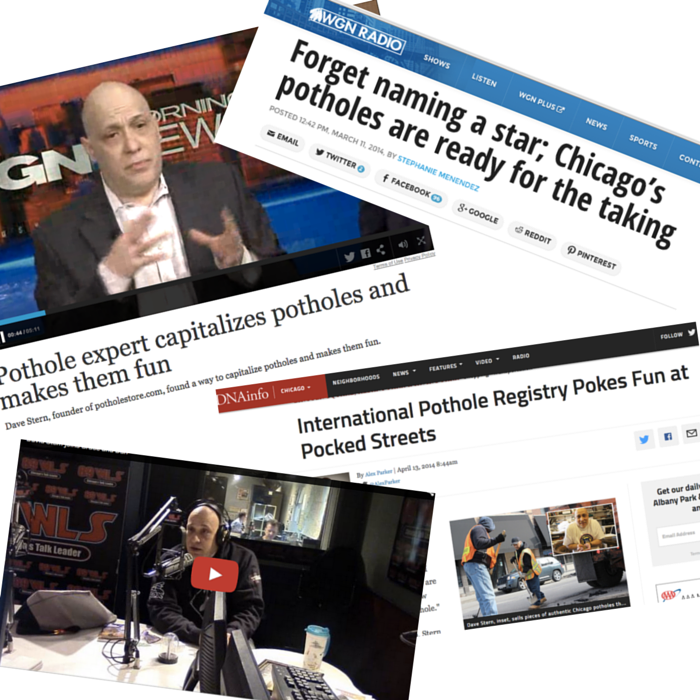 Taking advantage of the unseasonably large number of potholes that were littering Chicagoland streets, they created a website boasting the world’s largest inventory of 100% authentic Chicago pothole products. Made to order products included: Pothole Snowglobes, Quarter Bags of Pothole, Potholepourri, Pothole Earrings and Necklaces and the very popular Name A Pothole. Like the Waitle Nex Yeare stunt, the Chicago media pounced on the concept leading to appearances on: WGN Television, WGN Radio (three times), WLS Radio. Print exposure included: The Chicago Tribune, DNA Info, The Red Eye and Canada’s largest newspaper, Le Journal de Montreal. The orders started coming in and were filled with trash from Dave’s lawn, thus proving that virtually anything could be sold with a solid creative concept and an effective online marketing strategy. Our client was impressed, but our wives weren’t. If you’re interested in exploring innovative and unconventional ways to market virtually anything, our thirty minute “Out of the Box” tune up is a perfect fit.